Plans approved, here we go! | Sydney House. Plans approved, here we go! Once the black box idea had been cast, our architect was able to work more rapidly on the plans for council development approval. It feels like a huge triumph just to get drawings done, and yet we are miles away from turning soil. And even with careful consideration of tree issues, our Development Consent approval still took about 6 weeks longer than expected, due to extra stormwater plans being requested by council. And tree protection measures being proposed by council. Sigh. New South Wales is well-known for its nanny-state approach so it feels like a lot of red tape and a few extra thousand dollars protecting trees we would never harm anyway. But here we are, and YAY – the plans are approved! *Happy dance* ! 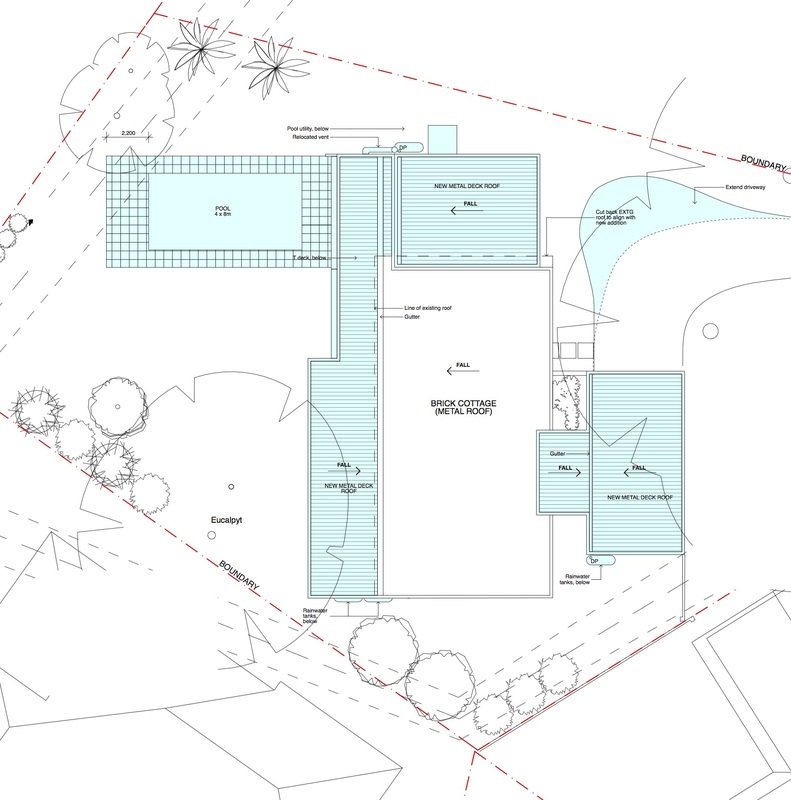 A Living and family/guest zone (2 storeys) added to the eastern side of the existing house, and facing the rear pool. Our timber boxes will sit atop a white brick ground floor, to continue the line of white brick already present in the existing single story house. Initially we did plan a playroom zone which was an extension from the kids bedrooms which would look out to the garden. It was a solution that came about because the original bedrooms are pretty small by todays standards. It would have a beautiful outlook, a long running desk and be a great zone for the kids and their friends as they grow older. Although this was resolved beautifully by our architect, we’ve decided to shelve that plan, and continue the deck along the rear of the property. Our kids are already older, and can see the benefit of outdoor space outside their rooms, instead of indoor. On discussing this with the architect, he also agreed as it was a great way to retain as much of the P&S house rather than cover it up with an extension to the rear. We also think a long deck simplifies the lines, reduces the costs, and will look pretty stunning! Now its time for detailing, which our architect is working on. Budgeting and finding a builder that wants to work with owner builders like us. In the meantime, we’re looking at lots of inspiring modernist renovations, colours and ideas for interiors.